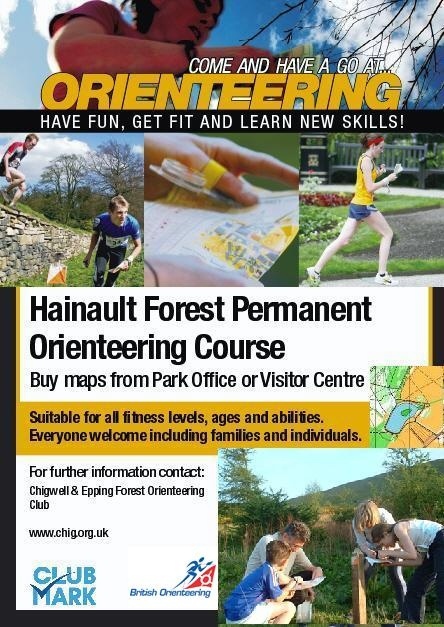 A permanent orienteering course means you can go at a time that suits you! The park has both North and South orienteering maps with courses for all ages and abilities on each map, all courses have route choices that enable use of paths for the full course and are wheelchair friendly. enabled. Hard copy maps and answers are also available from the information point in the south of the park (opposite the London Aquatics Centre on the bridge next to Westfield Stratford City) open daily from 10am – 3pm. The courses are set up for Mobo orienteering you can download the app to your smartphone and use it to navigate around the courses. For more information visit the MOBO website. The North courses start just to the north of the Copper Box Arena and cover the northern half of the park including the Velodrome, Timber Lodge Cafe and the Olympic Rings. The South Courses start at the information point near the Aquatics Centre and cover the southern half of the park including the Olympic Stadium, Arcelormittal Orbit and Mandeville Place. The South courses are currently being updated following park redevelopment. This permanent course is being reviewed and updated and should be available again later this year. Paper copies available from the Visitor’s Centre open Monday to Friday. Paper copies of the maps are also available from Pets’ Corner shop and Spurriers House Café. The Harlow Town Park course has been designed by Chigwell & Epping Forest Orienteering Club, with the co-operation of Harlow Council and financial assistance from Harlow Recreation Trust and from Awards for All. From Grange Paddocks Leisure Centre (Rye Street, Bishop’s Stortford, CM23 2HH) use just through the gate in the north east corner of the car park as your start and finish point. 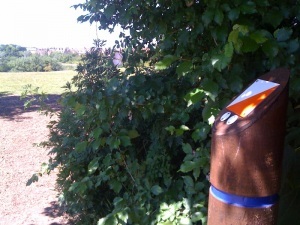 From Thorley Lane Car Park (Thorley Lane East, Bishops Stortford, Herts, CM23 4BH) go through the gate in the South West Corner of the car park and you will find a post with a ‘Friends of Southern Country Park’ plaque attached. This is the start and finish. There are other permanent courses around the south-east of England – full details here. Get a copy of the map (see details opposite), a small charge may apply. Bring a pen and paper with you. Find the Start on the Map (The Triangle). Using the map, decide which orienteering posts (See example in picture above) to find. Each post is marked on the map with a Red Circle. Use the pen and paper to keep a record of the markers you have found and to write down the unique letter for each control. A key skill in finding the control markers is setting the map. This means turning the map until the symbols on the map line up with the corresponding features on the ground. This helps to ensure you set off in the correct direction. Use tracks and paths to help navigate to the control markers.